Engineered wood flooring is composed of two or more layers of wood in the form of a plank. None can deny the appeal of a hardwood floor. It has a long tradition of luxury, and a timeless beauty. Those looking for that classic look and feel might do well to consider engineered hardwood flooring. 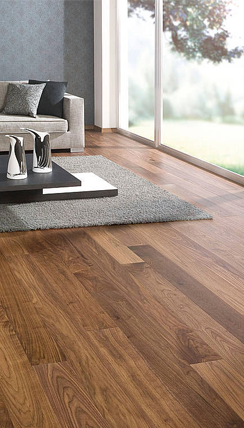 Unlike conventional hardwood, which comes straight out of a tree and into your home, engineered hardwood is a more complex product that consists of several layers. The top layer (lamella) is the wood that is visible when the flooring is installed and is adhered to the core. The increased stability of engineered wood is achieved by running each layer at a 90° angle to the layer above. This stability makes it a universal product that can be installed over all types of subfloors above, below or on grade. Engineered wood is the most common type of wood flooring used globally. Call Flooring Vision to discuss the right wood solution for your floors.